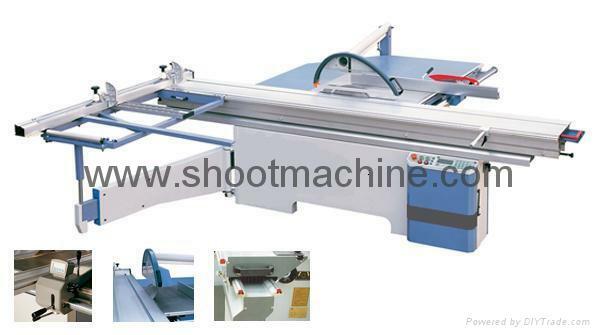 The machine is used to cut the wood, artificial board and aluminium alloy. Movable has advanced difference moving rolling bead straight track, has the excellence of stabilization, flexible characterize. Even the big workpiece can also move easily, and able to be fastened at random place. Double saw make sure that the section is smooth. The group of the saws can switch from 45º to 90º. It has the good qualities of high efficiency, high precise and easy operation, so is the important tool for cosmically producing. Artificial. Control panel with electronic control of blade raising and tilting. 1. The fence can be pulled out. 2. Upper dust collector unit. 3. Digital read out unit for parallei fence.